You are here: Home / giveaways / Congratulations, Sarah! 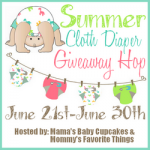 Congrats to Sarah G., who’s won my Summer Baby Loving giveaway. Thanks everyone for participating, and good luck if you entered to win in the other giveaways! Back to Work Giveaway winner!